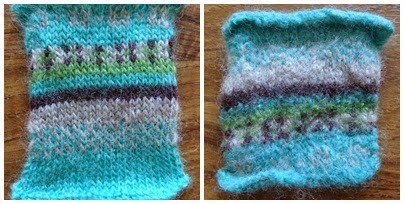 Louise Dawson Design: Fair Isle Felting Experiments! I'm currently teaching myself Fair Isle knitting using Wendy Ramsdale British wool with an aim of creating a Fair Isle jewellery collection for the Winter. 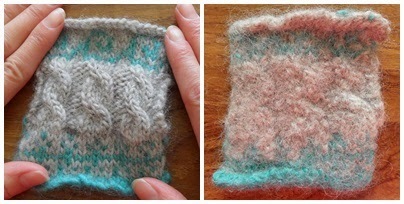 I'm trying out lots of different techniques at the moment to find out how the yarn behaves and here are some felting experiments I've been trying out, combing Fair Isle with other processes and then felting the samples in the washing machine. Here are some before and after photos! For this piece I hand knitted a Fair Isle sample and then felted it in the washing machine at 60 degrees to see how the patterns came out when felted. I had tried washing it at 40 degrees but it only partly felted. It's made a lovely thick felt which would be great for making brooches and I'm pleased that you can still see the patterns- further experimentation required! Take a look at more Fair Isle patterns I've knitted with Ramsdale here and read about how I tried Fair Isle in fabric! 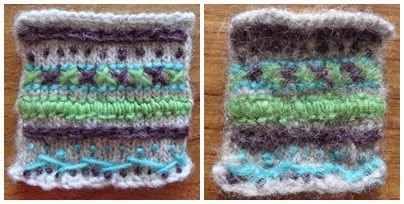 Now I'm off to experiment with combining cable, Fair Isle and embroidery in other ways, so I'll keep you posted! Interesting experiments, I suppose it's not surprising that a texture would be lost in felting. Good luck with further experiments. Making teeny-tiny fabric scrap Yo-Yos! Recipe: Blackberry and Marshmallow Cake!